A good friend and mother of a boy in one of my classes lent me the children's book, "Swimmy" by Leo Lionni (published back in 1963). I like to create art lessons around some of the wonderful children's book illustrations. Lionni has a unique and mysterious style. After reading the story to the group we began our take on "Swimmy". First we sponge painted our sea background with blue and green. Next we dipped cotton balls in yellow, brown and white to create sand. To make our seaweed we painted cut doilies with blues and purples. 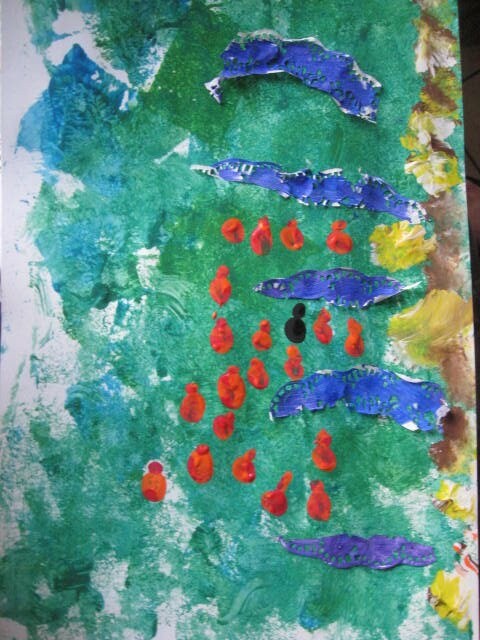 A school of red fish were done with thumb and finger prints. And of course Swimmy himself, was done in black. A few children opted to give him some look alike family members. This was a very messy but fun project! Some of the Mom's recalled the book from their childhood which made it all the more meaningful. Thanks for the inspiration! I am doing a public library program where we are looking at the artwork of Carle, Lionni, and Ehlert and will create our own art with those illustrators as the inspiration.